Brand New Smeg Range Cookers, End of Line & Graded Sale now ON! Smeg range cookers are renown for their retro style and high quality. The Appliance Depot offer a wide range of end of line and graded Smeg cookers. All the Smeg cookers available to order online from The Appliance Depot are built to the highest standard. 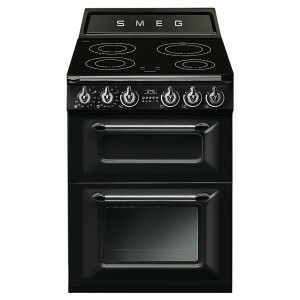 We stock a variety of single and double oven Smeg range cookers. Our online store has a variety of different colour cookers suitable for a wide range of kitchen styles. An Italian brand established in 1948, Smeg still manufacture all of their cookers and appliances in Northern Italy ensuring that all of their products are built to the highest standard. The Appliance Depot are proud to stock a wide range of Smeg cookers and products. Whatever your kitchen style or look, Smeg has a range just for you. Choose from the Victoria, Opera, Symphony and Concert ranges available in various colours including cream, black, and stainless steel. Some of the Smeg Victoria series are also available in pink or powder blue. Make your kitchen special and adorn it with a range cooker from Smeg. View our latest stock offers now…..
Smeg TR62IBL Black 60cm Victoria Traditional Dual Fuel Twin Cavity Cooker with 4 full power induction zones.